ONKOCHISHIN ～Learn a lesson from the past～ is our motto. This proverb is carved in wood black and it hangs on the wall in our company. And ONKOCHISHIN is also the name of our journal . Many-sided works of microbe, the present condition of application of microbe and the outlook on future are written in the main thema "Food", "Health" and "Environment". 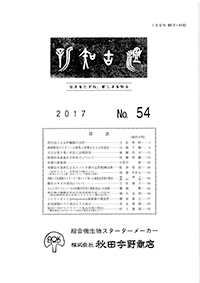 ONKOCHISHIN is correctly written as "温故知新" but "温古知新" is used in our journal. Modern calligrapher Tenrai Hidai took leave to adopt "古" instead of "故". Information of the latest journal.